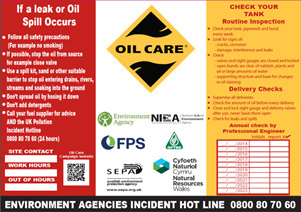 The Oil Care Campaign produces stickers designed to be put onto oil tanks to remind you how to look after your oil and what to do if you have a spill. The sticker gives information on what home owners should do if they have a spill from their tank. It also acts as a reminder to check the tank regularly, there’s space for a competent person to sign the sticker each year when the tank and associated heating appliances have been checked and serviced. The sticker is specifically designed to be used on industrial oil tanks. It includes a reminder for staff about what they should do if there’s a spill from the tank. Very importantly it also has space to add a contact name and phone number for the person who should be called if there’s a spill from the oil store. 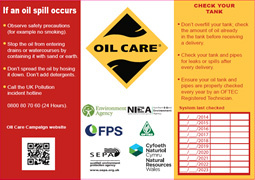 We also remind staff they should check their tanks regularly and before every oil delivery. Again there’s space for a competent person to sign the sticker each year when the tank and associated equipment or heating appliances have been checked and serviced. The sticker is designed as a clear reminder that only waste oil should be put into the tank. This is important under waste legislation as waste oil mustn’t be mixed with any other wastes. There’s space to add a contact name and phone number for the person who should be called if there’s a spill from the oil store and a reminder about what people should do if there’s a spill from the tank. 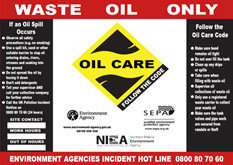 If you would like to order oil tank stickers for yourself or your company please call the Environment Agency on 03708 506 506 from anywhere in the UK, you may request up to 4 stickers free of charge.